A sweet combination that is perfect for saying "Happy Birthday" in an original and memorable way! 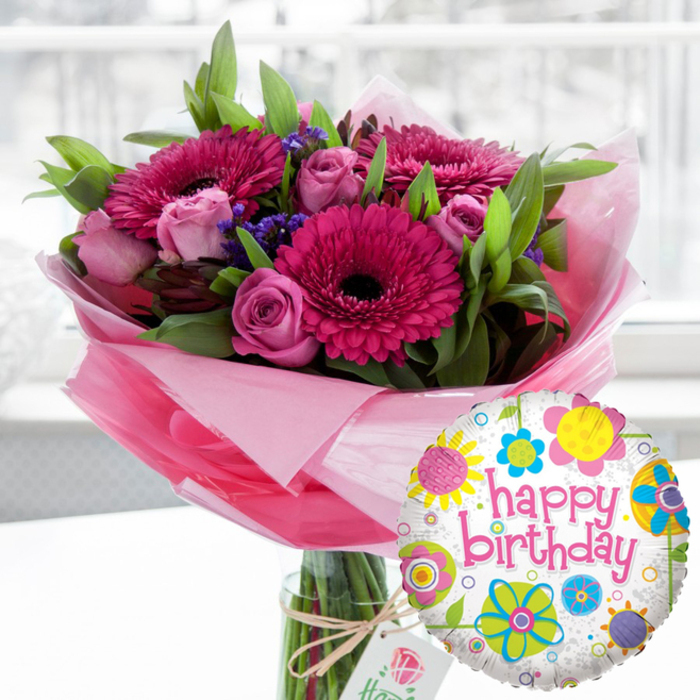 A cheerful birthday balloon is added to this glamorous bouquet to make the perfect gift for that special occasion. Original size bouquet pictured. Original bouquet contains 7 stems. My fears of purchasing from an online florist have hereby been neutralized! They really made everything simple, from beginning to end. Plus, the flower delivery was right on target! As for the hand-tied bouquet itself? Brightly coloured and graceful in overall design. The flower arrangement I ordered for a friend was stunning. Everyone raved about how wonderful it really was. Great bouquet, very stylish and pretty! The perfect surprise gift I've found online! I combined it with a specially made birthday cake and the birthday girl was overjoyed! Thank you! I just want to say that the flowers were delivered safely. The bouquet is truly eye-catching. My experience with the company was totally fine and stress-free. Will use them again soon. The perfect gift for my wife's birthday. What a nice idea to combine a beautiful bouquet and a sweet balloon. She will certainly love it! When I saw this combination I just knew what to get for my mother's birthday! The flowers were all fresh and vibrant!